1.New touch screen remote controller(effective distance more 50m,life time more than 5000h). 2.RGB Strip light installed in the bottom section and can be controlled by remote controller. 3.There are colored LED lights for options, including blue, green, red, pink, yellow, orange, white Total 17 colors. Step1: Open the package and take out inflatable wall and all the accessories. Step2: Connect the led light controller and power adapter befor you connect the power. Step3: Spread out the wall. Step4: When everything is ready, connect the power. 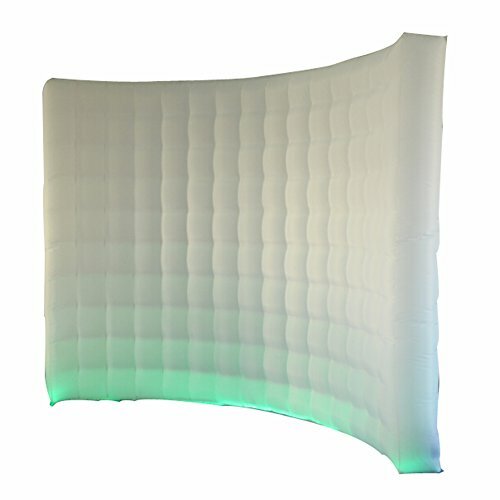 Step5: About 1 min, you will get a wonderful inflatable wall. 1) Pls keep the wall far away from anything sharp. 2) You'd better not use it when heavy raining and windy. 5) Pls make sure the wall is dry before you ready to store. If you have any questions about this product by Sayok, contact us by completing and submitting the form below. If you are looking for a specif part number, please include it with your message.